XTBA's Smart Switch 2:1 will give priority to two inputs of DMX data. This allows two DMX inputs to be on line and will automatically switch over in the event of a data failure or DMX error (e.g. break, mab error etc) on DMX1. 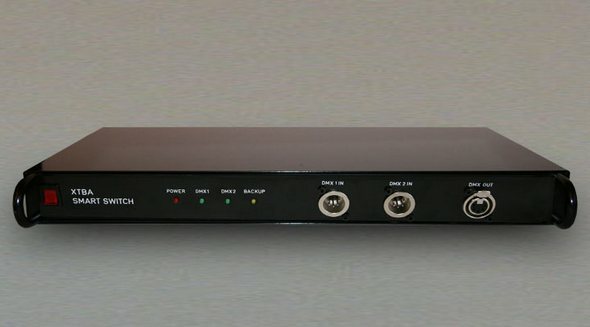 The unit can additionally set to give priority to DMX1 only, if channel 510 is set at full, so the switching can be achieved remotely. The Smart Switch can be used as an on line back up or simple routing system.